The goal of the New Hampshire School Safety Resource Center is to have a central location of the resources available to assist educators, emergency responders, community organizations, school mental health professionals, families and students in creating safe, positive and successful educational environments for students in all New Hampshire schools. Categories: The first menu identifies categories that were organized in the Governor’s School Safety Preparedness Task Force Report. These categories include Task Force, Legal Review, Legislative, Mental Health, Planning, Training & Exercises, Communication, Facilities Upgrades, and Links. Each resource is assign a category. Tags: The second menu identifies tags. Tags are useful tools to describe the intended recipients or content information. Resources are likely assigned multiple tags. For example, if you want to see all the resources identified as helpful for teachers then select the teachers tag. Search: The search option identifies resources that meet the criteria entered into the search field. For example, if you enter “bullying” into the search field all resources related to bullying will be sorted. 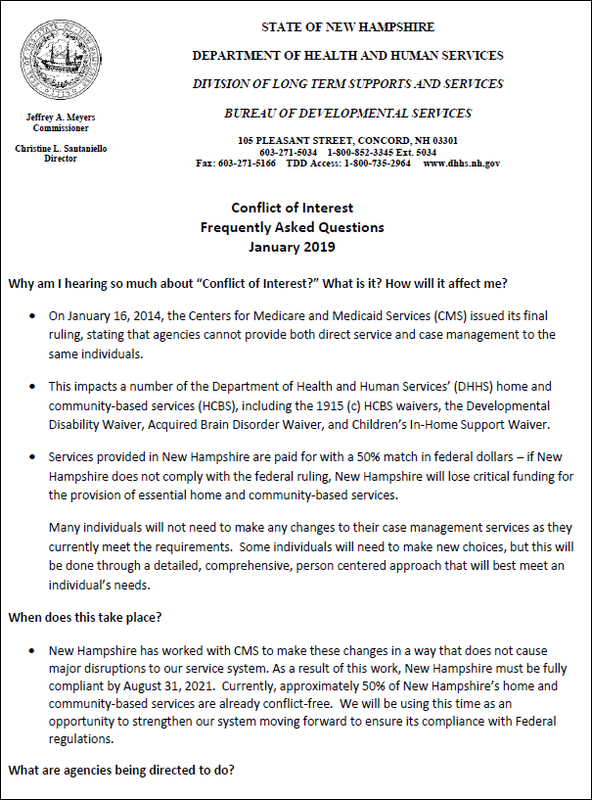 If you have a family member who receives services through the Developmental Service System of Area Agencies you may have you heard about the Corrective Action Plan (CAP) that NH is under, related to the Home and Community Based Services (HCBS) Waivers through the Centers for Medicare and Medicaid (CMS). The three1915 (c) waivers affected by this CAP are Developmental Services, Acquired Brain Disorder, and Children’s In-Home Services. The compliance issues addressed in the CAP focus on conflict of interest between case management and direct service delivery; and compliance with Medicaid billing rules, which allow providers to bill directly to the State.The HCBS Waiver is an essential component for the delivery of community-based services to individuals with disabilities and their families.Without it, the state would not be able to provide these critical services. Half of the funds provided through the HCBS Waiver are state dollars, with an equal match in federal funds. 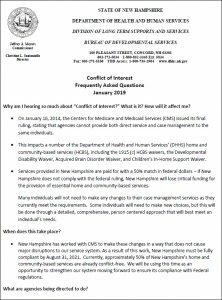 Here is the “Conflict of Interest Frequently Asked Questions” newly released from the Department of Health and Human Services, Division of Long Term Supports and Services, Bureau of Developmental Services. NHFV interviews Christine Santaniello, Director of the Division of Long Term Supports and Services within NH Department of Health and Human Services. NH Family Voices would like to announce a newly updated Maneuvering Through the Maze, A Family Resource Guide for families having children with Special Health Care Needs/Disabilities. This guidebook is formatted to take the reader from birth to adolescents transitioning into adulthood with listings of state health and human services agencies, educational resources, private associations and organizations that serve people with physical, developmental, mental health and chronic health conditions and their families. We have also added organizations and services that can be accessed by all state residents, such as housing, childcare, etc. All links within the document are hot linked for easy access. If you would like a hard copy of the resource guide please call (603) 271-4525 or Email to nhfamilyvoices@nhfv.org or use the ‘Contact Us’ form on the website. 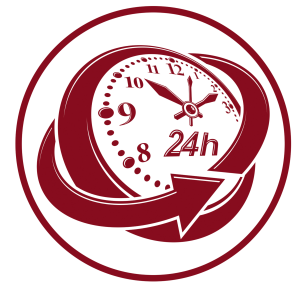 The resource guide is free to families but to offset printing and postage we hope you will consider a donation of $15 to assist us with ongoing printing. 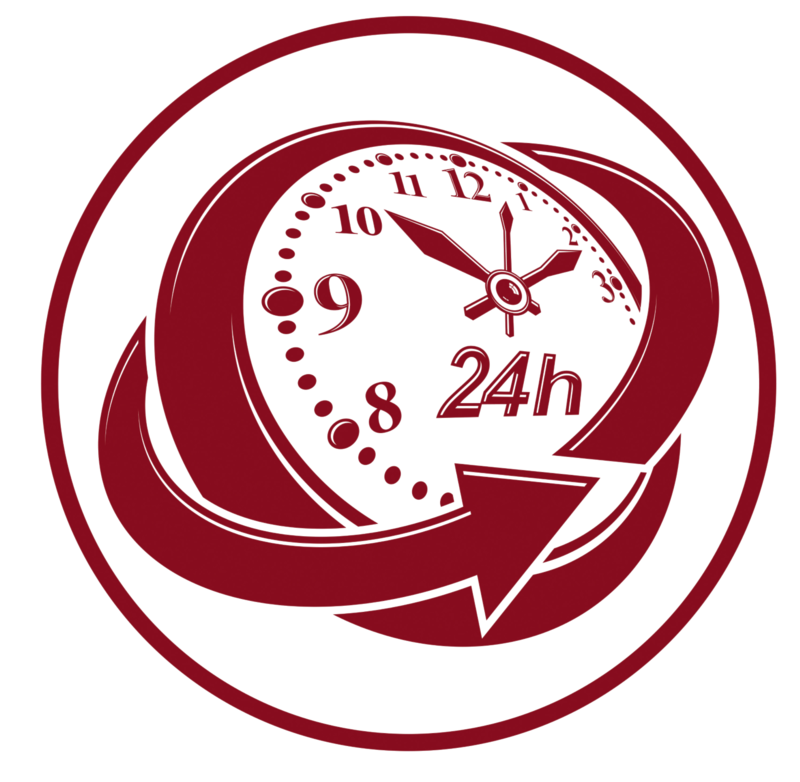 Are you interested in learning but don’t have a lot of time? Check out our podcast HERE.